Because it builds muscle and destroys fat. What’s not to love?! We know you’re doing your best to hit the gym and eat right, but now we have a whole new category of body contouring technology. With Emsculpt you can take your body sculpting efforts to another level. 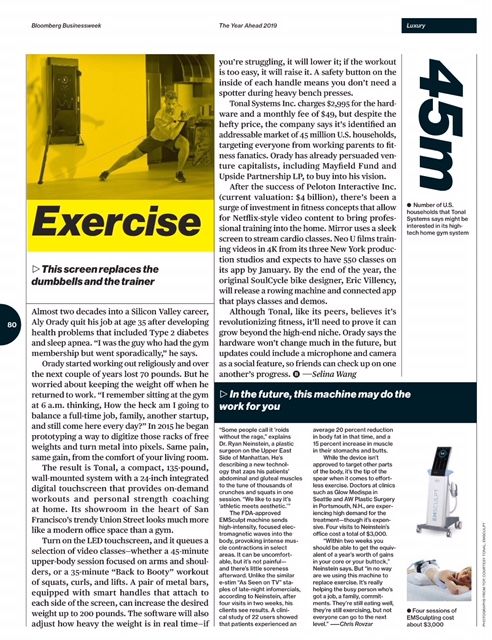 Imagine doing 20,000 sit ups in just 30 minutes or alternatively 20,000 squats in just 30 minutes. Emsculpt can help you achieve those results. Emsculpt is FDA cleared and offers the world’s first technology that can either build muscle only, OR simultaneously build muscle and burn fat. 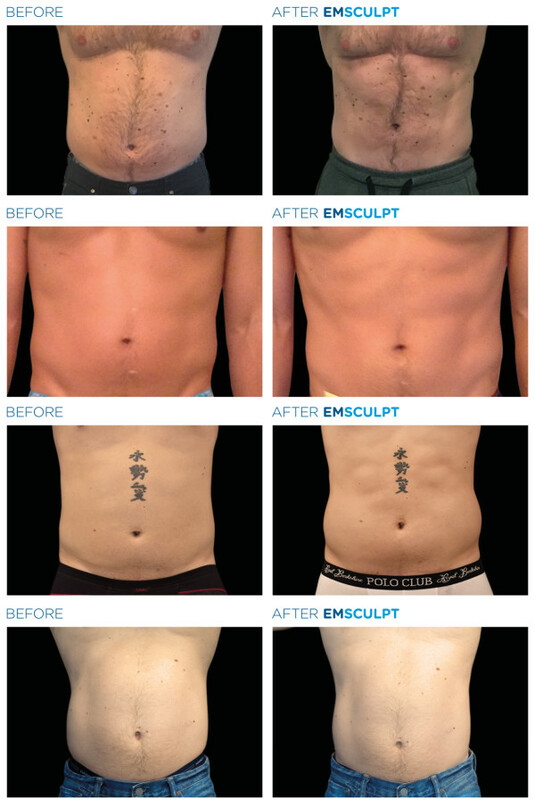 Per the latest clinical trials, Emsculpt offers patients up to a 21% average increase in muscle mass and an average fat reduction of up to 23%. Using HIFEM (High-Intensity Focused Electro-Magnetic) technology, Emsculpt, induces approximately 20,000 forced muscle contractions per session. These forced muscle contractions, clinically known as ‘supramaximal contractions’, cannot be achieved through regular physical activity. The outcome of HIFEM yields greater strength, tone and definition in the area for a more sculpted appearance. With additional settings, fat cells can be targeted in addition to building muscle mass. This creates a metabolic reaction – resulting in fat cell death. Clinical trials have shown a a fully executed Emsculpt treatment plan (four 30 minutes treatments, twice a week for 2 weeks), is equivalent to 6 months of working out in 2 weeks. However, because of the forced muscle contractions the treatment is a unique experience – but there shouldn’t be any pain. In fact, after the 30-minute treatment, you may feel quite energized almost euphoric! Over the next 24-48 hours, you may feel a little sore – just as you would after a big workout. However there shouldn’t be any pain or downtime. You should be able to hit the gym as soon as the next day! Keep in mind – Emsculpt as a body sculpting technology has a 96% patient satisfaction rating – so if you’re indeed a little sore, it’s worth it. How often do I have to do Emsculpt? The short answer is on average, twice a week for 2 weeks. Remember, that’s equivalent to 6 months of working out in 2 weeks. Emsculpt maintenance is also recommended. Because when it comes to muscle tone – as we know – ‘if we don’t use it, we lose it’. We recommend touch up treatments every 4-6 months to maintain the muscle tone you achieved from your initial investment. 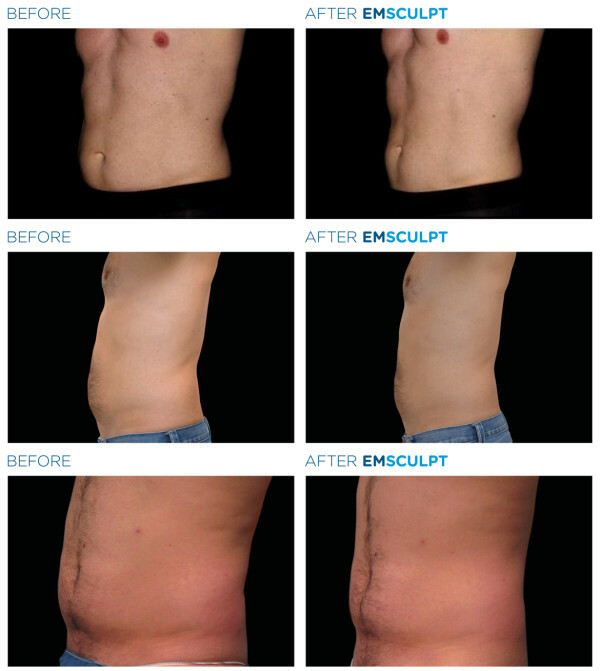 During your Complimentary Consultation, ask us about our Emsculpt packages that include maintenance options. When will I see my results from Emsculpt? Like everything, it really depends on the individual. However, an early sense of change can happen 2-6 weeks after the last Emsculpt session – with continued improvement for up to 4 to 6 months. How do I know if I’m a candidate for Emsculpt? A free consultation is truly the best way for you to understand the treatment. We can assess if you’re a candidate and what your treatment plan could entail. Financing options are available. Feel free to ask us about financing during your free consultation.